В 1928 году выполнила первый полет летающая лодка с экспериментальным облегченным корпусом Supermarine Southampton. Под обозначением A.14 аналогичную лодку спроектировала и построила компания «Saro». Успешные испытания позволили в 1930 году разработать улучшенный ДальшеMore>>> вариант Saro A.7 Severn. Характеристики полутороплана A.7 Severn оказались лучше, чем у двухмоторной Southampton, и были сопоставимы с данными трехмоторной Southampton X. Однако ВМС традиционно предпочитали изделие компании «Supermarine», поэтому заказов на A.7 не последовало. THE Saro A.7, designed and built by Saunders-Roe, Ltd., of Cowes, is one of the largest military flying boats built in this country, and is designed to carry out the same duties as the Saro "Valkyrie," namely naval co-operation, or open sea reconnaissance and coastal patrol as an independent and self-contained unit. Constructed entirely of metal, with stainless steel largely employed in the structure, the Saro A.7 is a sesquiplane flying boat of smart appearance, and capable of high performance. The machine has been so designed that it is easy to maintain under service conditions; whilst its quick take-off, smooth alighting and clean running make it very serviceable for its work as a seagoing craft. The hull, which is constructed on the Saro patent principle, has an interior which is light and roomy, and permits freedom of movement inside from end to end. The bow cockpit is equipped for mooring, towing, bombing and machine-gun operation. The control cockpit immediately behind it contains two comfortable adjustable seats, conveniently arranged for operation of the dual engine and flight controls. Next comes the engineer's, wireless and chart room, which also contains sleeping accommodation. The whole of this compartment is well equipped with swivel chair, chart table, racks and stowage for navigation instruments, and at the aft end is mounted in switchboard fashion a set of engine instruments. Further aft is arranged a mess room and galley, with dining table and settees, and ample stowage and locker space provided. Communicating with this compartment is an elevated platform giving rapid access to the gun ring, which is adjacent to the upper main plane trailing edge. From there one can proceed to the tail gun, which is at the extreme end of the hull. The biplane wings, which are of such structure and form as to require a minimum of struts, have the lower wing of considerably less size than the upper. The bottom plane is of just sufficient span to carry the all-metal wing tip floats. The upper wing has considerable overhang, and carries the only ailerons fitted, which are of the Bristol-Frise pattern. This upper wing is divided into three sections, the two outer portions being of tapered form. Three Bristol "Jupiter IX" engines, each developing a normal 485 h.p., are carried on the underside of the upper plane, into which they are carefully faired. The petrol tanks are carried in the upper wing, and the fuel system is of simple gravity feed, with its attendant reliability. No engine fuel or oil is carried in the hull. A braced monoplane tailplane carrying two elevators is fitted to the rear end of hull, and two fins are mounted thereon, each carrying a balanced rudder with servo rudders. The fins and rudders are braced inwards by two struts. A normal accommodation is provided for a crew of five, comprising a pilot, second pilot navigator, engineer, wireless operator and gunner, and an excellent view is obtained from their various stations. Whilst complete data regarding the Saro A.7 may not be published, it may be stated that the machine has an overall span of 88 ft., an overall length of 64 1/2 ft., and in its fully loaded condition has a gross weight of approximately 9 1/2 tons. Its military load is similar to that carried in the Saro "Valkyrie," of which the A.7 is an improvement in design, construction and performance. 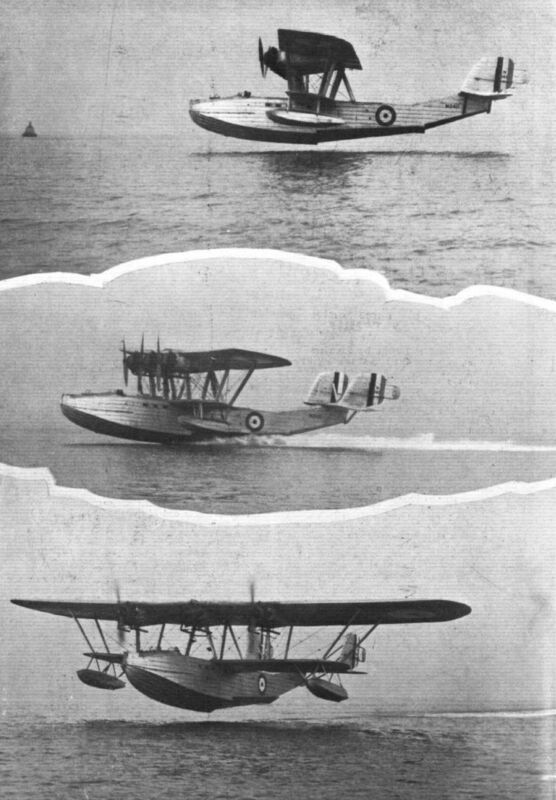 FROM the time Sir Alliott V. Roe and Mr. John Lord joined forces with Mr. H. E. Saunders, the firm of Saunders-Roe has pursued a vigorous policy of flying-boat development. During a period of a few years no less than four distinct types of flying boat have been produced, of which three are civil types, the fourth a military machine. The Saro "Severn" is a three-engined long-range open sea reconnaissance flying boat fitted with three Bristol Jupiter XI.F. engines. The hull is of all-metal construction, as are also the wings, with the exception of the covering. The machine is intended to carry a crew of five, including pilot, second pilot-navigator, engineer, wireless operator, and gunner. The machine has a length of 61 ft. (18,6 m.) and a wing span of 88 ft. (26,8 m.). The total wing area is 1,500 sq. ft. (140 m.=). No weight or performance data are available. Корпус A-7 мало отличался от корпуса летающей лодки Southampton, но силовая установка состояла из трех моторов Bristol Jupiter IX мощностью по 485 л. с.THE SARO A.7 FLYING BOAT: Designed for open sea reconnaissance work, this machine has a metal hull of the same type of construction as that used in the Saro civil machines: Cloud, Windhover and Cutty Sark. The engines are Bristol "Jupiter IX." 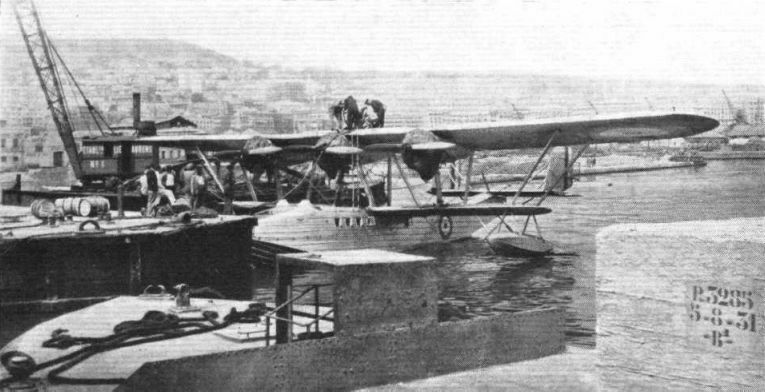 THE SARO A 7 AT ALGIERS: A picturesque view of the R.A.F. flying boat refuelling with Shell aviation spirit at Algiers during its recent cruise to the Near East.